While the 1965 Corvair was received as a well-engineered high performance driver's car, that accomplishment was overshadowed by the phenomenal market success of the Ford Mustang. GM saw advantages to the route adopted by Ford with the Mustang, a four-seat semi-coupe body on a standard compact (Falcon) chassis with a small-block V8 motor and four-on-the-floor offered as power options. The Corvair was not cheap to produce; developing and marketing a Mustang-style model based on the Nova platform had cost advantages. Unlike the Corvair, a derivative model could evolve within GM's standard lines of manufacturing technology. The 1965 publication of Unsafe at Any Speed sullied the reputation of the Corvair line, although the issues had nothing to do with the current model. Under competition from the Mustang and the publicity hit of Unsafe, Corvair sales plummeted by over half in 1966. GM saw the advantages of developing the Camaro, not the Corvair. According to GM historian Dave Newell, Chevrolet had planned on ending Corvair production after the 1966 model year.Development and engineering changes were halted in 1966 on the year-old, redesigned second-generation cars with mainly federally mandated emissions and safety changes made thereafter. 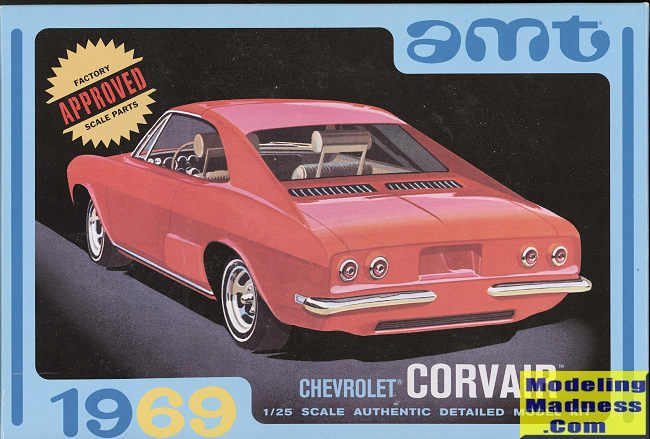 An increasing lack of interest from the company, especially from Chevrolet's General Manager John DeLorean, and a complete absence of Corvair advertising after 1967 reflected the company's priorities, including promotion of three redesigned models for 1968—the Corvette, Chevelle, and Chevy II Nova. 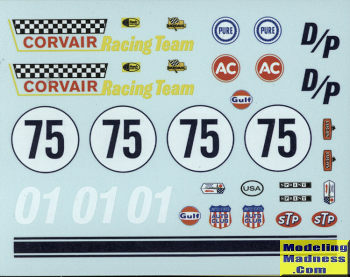 The Corvair was referred to as "the phantom" by Car Life magazine in their 1968 Monza road test, and by 1969 Chevrolet's Corvair four-page brochure was "by request only". During its final year of production, 6,000 cars were produced. Chevrolet had proposed a third generation (1970-on) Corvair, essentially a re-skin of the 1965–69 model resembling the 1973 GM A Body intermediates, particularly the 1973 Pontiac Grand Am, retaining Corvair proportions. Having passed the point of full scale clay models, Chevrolet stopped developing the model in early 1968. Unlike the Turbo Hydramatic 400, the Turbo Hydramatic 350 transmission, introduced in the 1968 Camaro and later adopted by most Chevrolet models had been configured for use in the third generation Corvair. It This is a reissue by Round 2 of AMT's kit. This kit was initially released in 1965 as the then new Monza kit. In 1975, the kit was modified slightly to duplicate the 1969 model year. The base kit and this variant have been reissued several times over the years with the 1975 boxing adding a number of additional bits. This is a fairly complex kit, offering two engine intake options, four exhaust options, two tire/wheel options, a street and competition interior option, as well as several body options. It means you fairly well need to know what you are going to build before starting. Typical of car kits of this era, you have a full body with a tub style interior with the back seat molded in place. One adds the instrument panel to the forward tub and then the interior bits of your choice. The engine itself provides a goodly number of options. The intake can be stock or have velocity stacks or low restriction air cleaners above each of the four carbs. Exhaust can be stock, competition, or a custom or sprint exhaust with glass packs. You do have to build up the rear suspension with the front simply slotting in place on a metal axle. There are various scoops for the competition/sprint versions with additional rear window 'wings' that were part of the Yenko 'Stinger' boxing. You also have custom taillights and can leave off the front bumper for the competition car. A single clear part for the windows is provided so you'll want to have the body pretty well complete before installing this. The chrome parts are very nicely done, though removing mold seams will require repainting on some parts. Instructions are the 'road map' variety and provide all your color information during the build. A nicely done, but thick decal sheet is provided for the competition and sprint version. My experience with the fit of most AMT kits I've built has shown me that these need to be built fairly carefully with lots of test fits before applying cement. The Corvair is a car that got a lot of bad press for the initial versions with this generation of car taking care of all those issue. It is still a good looking car and should make a great model.